A big part of the RTOWN digital toolkit is listening to your customers. Not only is customer satisfaction a great way to measure how your business is performing, it can help you identify your problem areas and make changes accordingly. A problem we identified in early iterations of our Customer Voice product was actually getting people engaged in a survey and giving you good data. This is a problem that carries over from the bygone days of printing paper cards and relying on people scribbling down comments and leaving them in a box or with a staff member. Digital surveys were getting good data and customer information from the responses. however; response rates never peaked above 5% of the audience. Well, as we like to say at RTOWN, we found a better way. So, unfortunately someone had a poor experience in your business. They get the survey and hit the red "sad face". A team member of your choice will immediately get an SMS notification and they can deal with the situation accordingly and immediately. This rating system sets the tone for the whole survey. A negative rating will also follow-up with a customizable email apology and an optional gesture to earn back their business. A favourable rating or "Happy Face" will send out a customizable email thanking them for their visit and to come again soon. Pretty cool right? The questions in your survey can be modified at any point. If you have a specific business decision to make, you can gather data around it and let your customers be the guide. 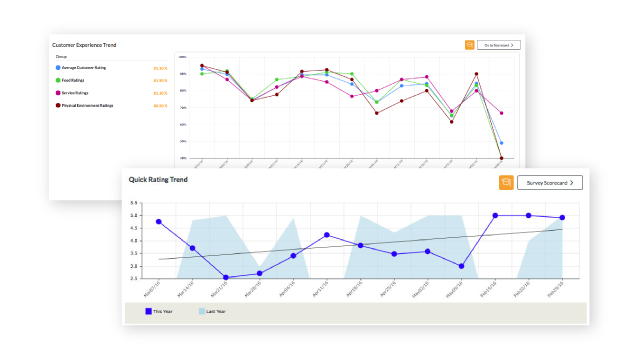 When you make changes to your service, you can track if the overall customer sentiment trend shifts. You'll be able to review this data compared to previous periods to truly track progress and growth. This survey can be implemented in so many places that we have seen response rate skyrocket upwards of 65%. That's right 65%. This truly dynamic survey is responsive to any screen size (looks great on a smartphone or a desktop) and is almost irresistible to engagement from almost anyone. Who wouldn't tap a choice of faces to reflect their experience? Once that initial barrier is overcome, the responses come pouring in. The tablets are by far the highest engagement point and are highly recommended for any business case. We are only just getting started on what this platform can really do for your business. Give one of our digital strategists a call today to learn more about this awesome new product.